Hi everyone, welcome to my citrus design tutorial :) I first made this design for my entry in the Good Enough To Eat contest at Nail Polish Art Addiction, a few months ago. The shape of a sliced citrus fruit has always amazed me for some reason, so for the contest I made this exotic, abstract pattern. A few of you dear readers requested a tutorial for it, so here it finally is :) Now go pick three delicious, summery polishes, your nail art brushes and let's do some nail art! Start with the base color you like (if necessary with a basecoat underneath) and let it dry. 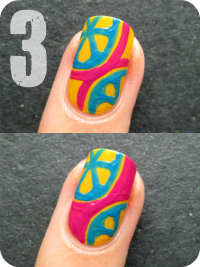 Then use your nail art brush and a contrasting, opaque polish or acrylic paint to draw a few circle shapes. Spread them evenly on the the surface to make a nice composition. Then divide each circle in slices and round the two outer corners of each slice. Clean your brush (or use a new one) and use a third color to surround each circle shape with a line. Leave a small gap between the circle and the line if you can. 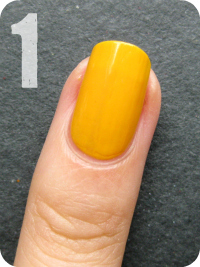 Then fill in the gaps with the same color and let the whole nail dry for a few minutes. Tip: To clean your nail art brush(es), pour a little bit of nail polish remover in a small dish or the cap of the bottle. Let your brush soak in it for a few seconds and dab it a few times on a cotton pad. Repeat this until your brush is clean. Products I used in this post are OPI The It Color, Essence Let's Get Lost and OPI Dim Sum Plum. Super cute design, I love it! This is so cute! Great design! So cute! Didn't think it would be done like that, works so well though! Oh my gosh this is completely adorable!! Sooooo cute! Wow! I love this. I would have never guessed the yellow was your base colour, Lol! You say to use either polish or acrylics. I assume you used acrylics? I didn't think yellow was the base color either...WOW, love it. so cute!! and it looks really easy! So adorable!!! I love citrus (live in FL) so this is right up my alley! Can't wait to try it, I have some orange sparkle that would be more literal but cute! Thanks as always for a great tutorial!! 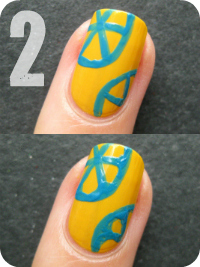 I love this tutorial after i read it, I immediately tried it! Let's see if I can try it today! I'll send you pictures! So FRESH! Clean lines. Simple and effective. It is funny how "simple" designs often are the ones your eye turns too. Love it!! What's the yellow that you used?